Playing with Rigamajig | KaBOOM! Rigamajig has developed project plans for educators to kickstart their kids' use of the collection. 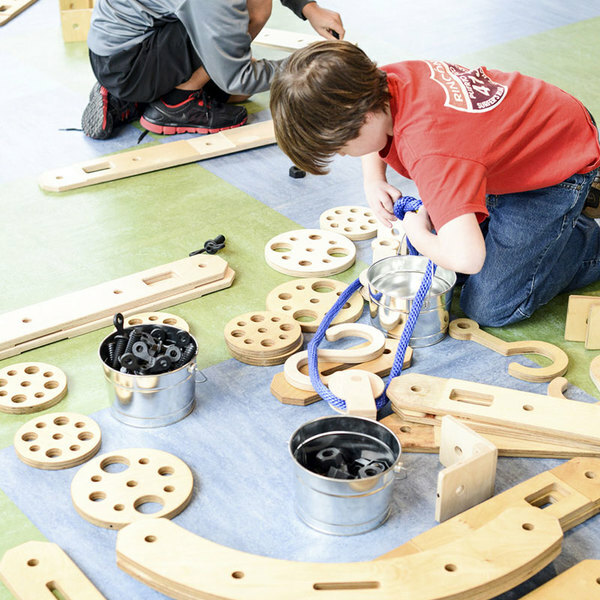 With a focus on collaboration and problem solving, the project plans range from the exploration of the various parts to pulley creation. 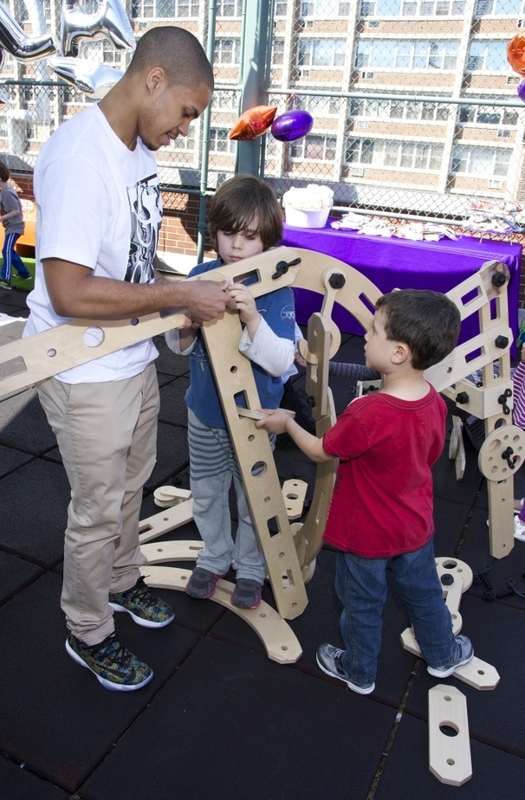 Educators can utilize Rigamajig in many parts of their curriculum. 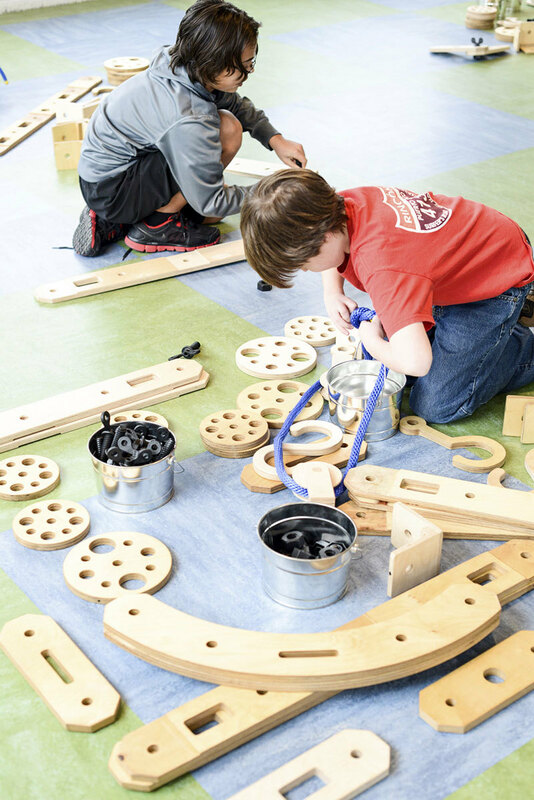 With the help of a few adventurous teachers, this user guide helps educators integrate Rigamajig into their classroom, playground, or playspace. Design, analysis, and construction make up the core (or heart) of Rigamajig. Form and function are continuously analyzed as children try to create something that satisfies human and environmental needs. 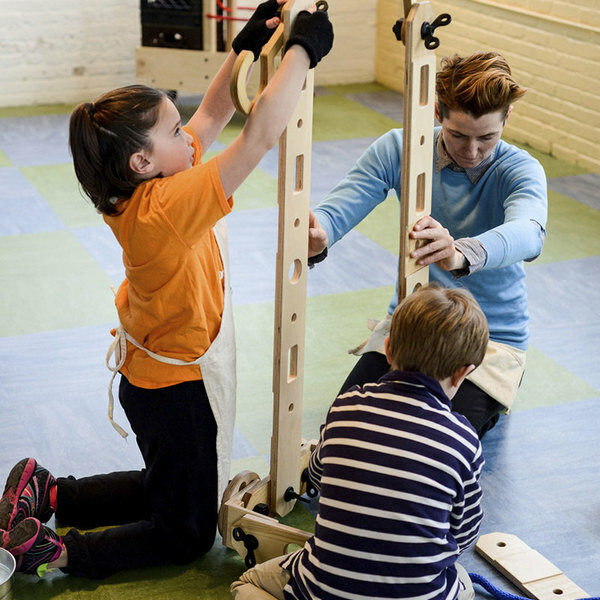 Children construct and use simple machines, ponder the concepts of compression and tension, play with balance, and learn about the properties of wood, all the while considering how various parts relate to each other in order to create small systems that perform a multitude of functions. Children simultaneously practice problem solving while designing and playing with their technological inventions. They create and work with simple machines (e.g. pulleys, ramps, and screws) as a means to create new, more complex machines. Throughout play, children experience all parts of the invention process: research, comprehension, design, model building, testing, and modification. Art reaches far beyond creativity, involving observations, prototypes, tests, and changes. Art exercises the parts of the brain that allow children to approach problems with an open mind and think outside the box. 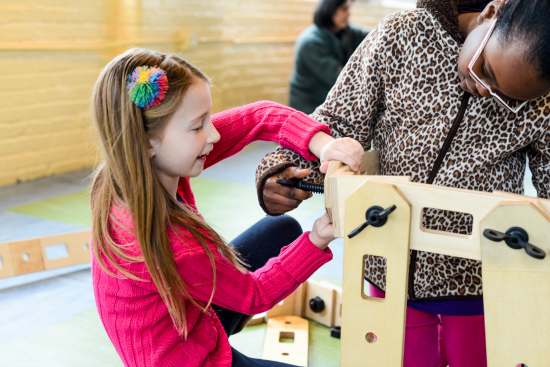 The modularity of the planks helps bring math language into children's play. The parts work together intuitively as units for easy building. Two small planks are equidistant to one large plank, thus embedding geometry within play. Similarly, clean up time is always an opportunity to count and sort. For young children, social studies is the science of learning to live, work, and play within a community. Rigamajig teaches children to work in small groups, develop social skills needed for negotiations, and find their voice. The materials in the Rigamajig Basic Builder Kit have inherent interest for young minds. Children are intrigued by the variety of components present and often lead their own discovery at no prompting from adults. This section highlights best practices of how the adult can support and encourage the children to continue their investigations, despite frustrations, challenges, and excitement that can come from the design process. First, take time to consider the dynamic of the classroom or playspace. Next, read the examples of the several different roles adults can adopt as they work with children in the classrooms, afterschool programs, camps, museums, and STEM learning centers around the world. Challenges and "play prompts" are not always necessary for children to begin the process of exploration. However, the adult(s) may find that prompts are most useful to children and effective for learning once children are familiar with Rigamajig. Prompts can provide a fresh point of view for the children to contemplate and perceive their work. One of the most interesting observations when working with children is that their ability to make an idea can be very different from their ability to conceive an idea. When an adult interacts with a child, there is the option to interact with the child's idea or with the child's making. As a best practice, ask questions as a way to help the child(ren) explore their concept and encourage them to create independently. It is important that the adults present are encouraged to observe and listen to the children as they play. Attentively seeing and hearing the children's visions, the adult might repeat back parts of what the child described, creating an environment promoting reflective learning. "What dynamic is created when the adult interacts in this way?" "Do the children expand upon their idea(s) with deliberate thought and action?" Use the storage cart to allow children to see the materials easily at a glance. Keep like parts together, for example: plankssorted by size, brackets together, nuts with wingbolts, then rope, and other materials. Consider organizing the pieces while playing; sorting and stacking make a great cooperative activity. It is also helpful for containers to be labeled with words and symbols to help visually locate work materials and help return them during clean up. 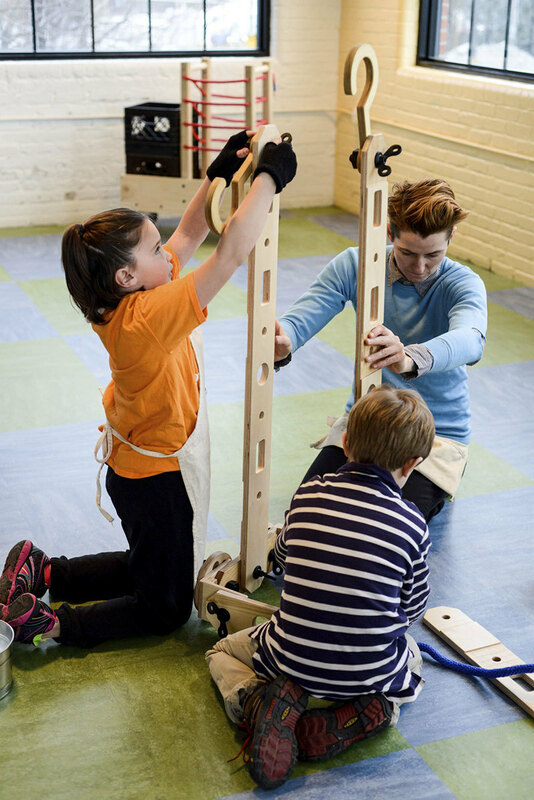 This organization gives children a sense of ownership and independence while building with Rigamajig. Will the children work in one group, several smaller groups, or individually? How will the work space(s) be defined? What methods can be applied to the session to encourage children to take the materials that interest them and move away from the "central" storage? How will the pathway to and from the materials the "central" storage area remain clear during a work session? Depending on the area designated for Rigamajig play, it may be helpful to include a background or gallery of images depicting buildings, structures, and machines to be inspiration for the children as they work. Additionally, using photographs of the children at work, capturing their process and progress, and including them in or near their work environment, encourages reflective thinking on past work. Documenting the children's construction helps encourage them to build with intent. Having the children make a "portfolio" or "glossary" of what they have created captures the possibilities, promotes pre- and post-build conversation about what they have achieved, and inspires what they build in the future. Children have varying learning styles and paces at which they learn as they explore the world around them. As children begin to build with Rigamajig, progressing from novice to expert users of the kit, adults may begin to see patterns of learning and development in individual children. Learning and growth varies child to child, as learning is not linear; rather, it is like branches of a tree suggesting the many possibilities of learning at each turn. During a build session, adults will witness children manipulating the components of Rigamajig to meet the needs of their learning level. Some children spend the session satisfied with two objects. 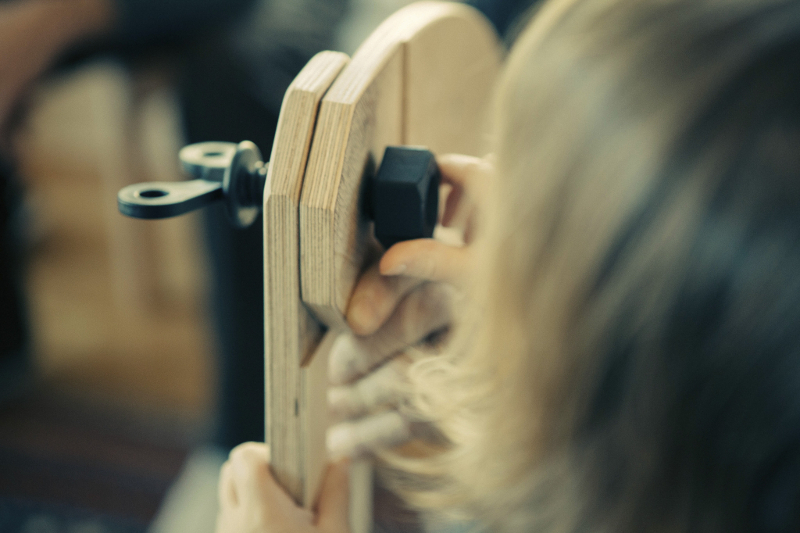 While other children will use nuts and wingbolts to make random connecting pieces, deciding what "it" is after they have completed their creation. Meanwhile, other children will have an idea from the beginning and proceed to create that specific concept. It is important to realize that all of these stages are valuable and none better than another. Each initial interaction and interest is the essential starting point of what educators want to validate— an investigation. Play, fantasy, and imagination are all part of children's everyday cognitive thinking and investigations. It is when these are all manifested in a single activity that children invest and fully engage in problem solving and amazing feats of creativity. In this way, children are much like some of our greatest thinkers. Teaching and learning is most exciting in the moment when children can utilize their full capacities. Rigamajig can be enhanced with other props and materials that are appropriate for the age of the children in the group. Add more rope, sheer fabrics, canvas, pots and pans, dolls, door knobs, and found objects to increase the Rigamajig experience. Providing appropriate space and organization for these materials will impact the way children develop relationships with the materials. Build a Rigamajig that can lift something. Make a Rigamajig you can get inside. How many different ways can you join three pieces? Create a contraption that allows you to send a bucket from one place to another. Make a machine that will take you to the center of the earth. Now that you have made a structure, look at your neighbor's creation and find a way to join your two structures to make a new one. What might it do? Using 15 pieces, develop a contraption that can hold a 10 lb. bag of potatoes. Create a structure that would allow you to live on a cloud. Build a Rigamajig that would allow you to ride a whale. Develop a creation that includes a chair. What is the tallest free standing structure you can make with 15 pieces? What can you build with 20 pieces? Make a contraption that incorporates a balloon in a useful way. Invent a structure that uses an empty box. Tell/write how each of the parts work in your invention. Draw a picture of your Rigamajig and label the parts. Next give instructions for how it works. Tell a friend about your invention. Write a short story essay about your Rigamajig. 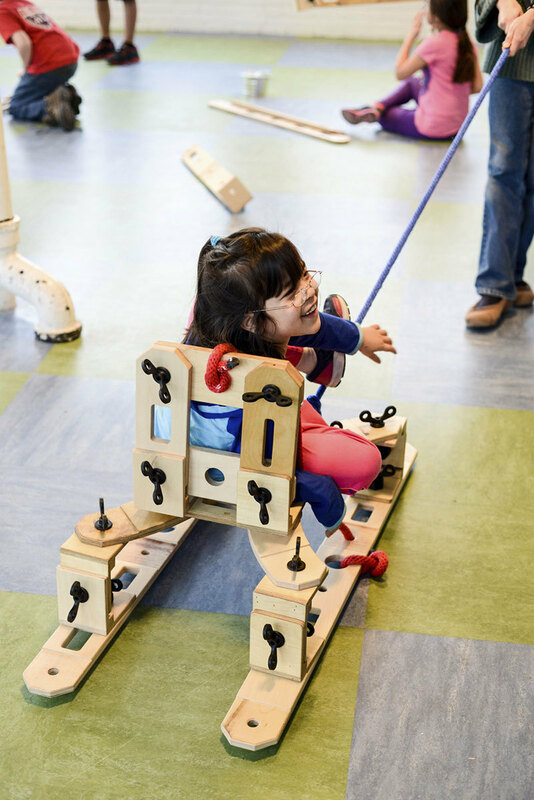 260+ parts total, all parts manufactured in the U.S.
Children should be supervised at all times while playing with or around Rigamajig. Rigamajig contraptions should never be climbed on, stood upon, or ridden. 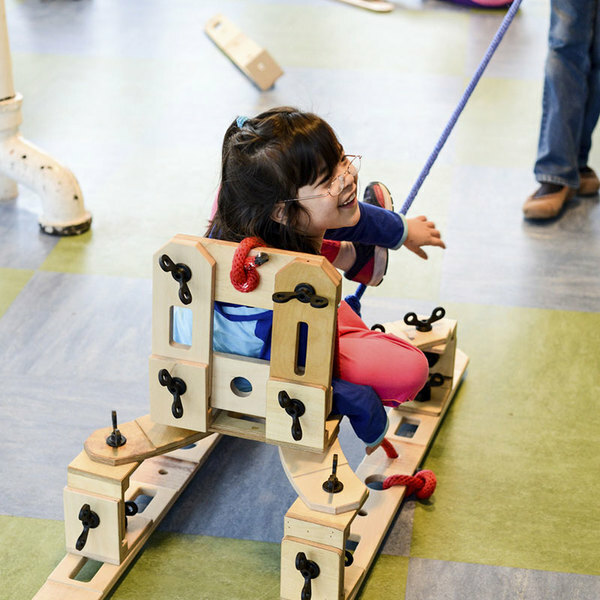 We believe that large solid wooden parts are an empowering way for children to explore constructive and imaginative play. Encourage children to be aware of their surroundings and play cooperatively. Children and adults should be cautious during the disassembly of Rigamajig contraptions. Encourage children to work together when taking things apart. The deconstruction of Rigamajig creations becomes a great learning opportunity. Cause and effect, balance, planning ahead, counting, sorting, and organizing are just a few things that can be practiced during clean up. With a little attention, Rigmajig will last generations. We recommend periodic inspections to insure planks remain smooth enough for tender hands. If the planks suffer dings and dents, simply sand lightly with 300 grit sandpaper to prevent splintering. To refinish the wooden elements, lightly sand the surface and refinish using a trusted brand of child safe varnish. Follow the manufacturer's instructions for best results. Wingbolts and nuts are made of an extremely durable recycled nylon. They can be washed with soap and water or in a washing machine. Send us a message or call us at (202) 464-6185 for answers to purchasing questions. The reCAPTCHA box must be checked to submit the form.